Well it took a little extra time, but true Winter weather seems to finally have hit New England. I admit that I am not a big fan of this season, I just don't like being cold. So I enjoyed the unusual warm weather while it lasted. But now it is time for fun, outdoor winter activities. Our boys are itching for a good snow fall so they can get bundled up and do some sleighing. A lot of people around here and throughout New England head up to the ski resorts this time of year. Before my husband and I started dating, he went skiing a lot. Then the poor guy met me. At that point I had never been skiing and honestly had no desire too. Like I said, I don't like the cold. He did manage to get me to the Vermont slopes twice. Both times I took ski lessons and survived and even managed to do somewhat of a decent job. My favorite part was on the second trip which was to Killington in Vermont. After spending the day skiing, once the sun went down we went tubing. I never thought tubing could be so much fun! 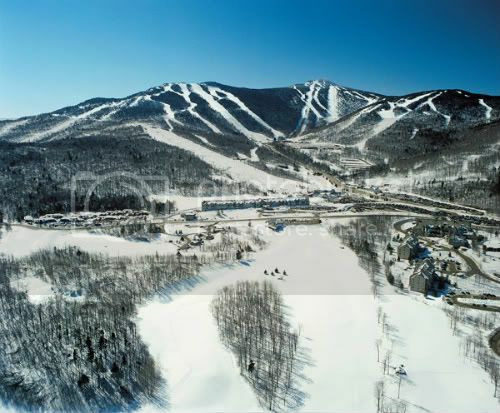 Killington Resort is located in Vermont's Green Mountains and is known as "The Beast of the East." There are plenty activities for the entire family. In addition to great skiing areas, there are multiple terrains for snowboarders, dog sledding, cross country skiing, snowshoeing, ice skating, snowmobiling and the all-new Killington Tubing Park. There was not a tubing park way back when we went, that would have been awesome! If you are a beginner like me, they offer lessons for both adults and kids. When its time to relax after a long day on the slopes, Killington has lodging to fit every budget. There is the luxurious Grand Hotel & Spa, cozy condominiums plus more than 100 properties throughout the Killington region. If you are planning to head to the Vermont ski areas this Winter, Killington is definitely a stop that you want to make. Head on over to Killington.com today to plan your winter getaway for your family. One (1) lucky winner will receive a Family 4-Pack of tickets! Tickets are good for one day inside the Killington resort. They can be used any day before the season ends in April 2012. Please use the Rafflecopter form below. Giveaway ends January 26 at 12:01 AM EST. I did not receive any form of compensation for this post. I just wanted to host a cool giveaway for my readers! I would give the tickets to my daughter to use for her family. If i won tickets, id love to bring my hubby. I'd take the boys! They both snowboard. I'd love to bring my brother and his wife. They recently had a little one and could use a day away! We're looking at possibly relocating to VT. This would be a great opportunity to see the area before we commit,and a fun family outing! I would take my wonderful family! Thanks so much for the fantastic giveaway! Since it's only a 4 pack I'd have to leave one kid at home :( I'd bring as much of my family as possible. If I win for certain I would bring my husband and 2 daughters. My girls have never gone skiing and I've been wanting to take them for lessons but it's so dang expensive! This would make it affordable to try it out for a day!! !